If anyone was hoping the election would deliver some form of reprieve from the hundreds of overlapping claims for the foreshore and seabed, resulting from National’s disastrous Marine and Coastal Area Act, they will be sorely disappointed. The only politician to campaign for a law change was Hone Harawira, leader of the Mana Party, and he wanted Maori control of the entire coastline: “I want people to know that a vote for me is to return the foreshore and seabed into Maori hands”. Hone Harawira’s response to these comments was derisory: “Now you’re a dirty low down skunk. You need a kick in the arse for saying that our people don’t care about the foreshore and seabed being stolen. We did then, we do now and we always will”. Between them, tribal groups have lodged almost 600 claims under the Marine and Coastal Area Act, covering every square inch of New Zealand’s coastal marine area. That’s the distance between the average spring high tide waterline and the 12 nautical mile territorial limit. Included is the airspace above the area, the water, and the subsoil, bedrock and mineral wealth below. Altogether, almost 10 million hectares of the country’s most precious natural resources is now under claim. That’s equivalent to more than a third of the land area of New Zealand. This whole debacle was triggered by what is widely regarded as a rogue Court of Appeal decision in 2003. Although under common law the foreshore and seabed was owned by the Crown, the Court found that some customary title might still exist. They deemed that the Maori Land Court should hear the claims. Although the Judges cautioned that the test for customary title was high and that such findings would be rare, their decision unleashed a flood of claims for the coast, some right out to the edge of the 200 mile Exclusive Economic Zone. Worried that the Maori Land Court might award private title, leading to the progressive privatisation of New Zealand’s coastline, the Labour Government legislated for Crown ownership through their 2004 Foreshore and Seabed Act – which left the door open for customary rights claims. But Maori leaders complained that the bar for proving customary rights was set too high for claims to succeed. As a result, in their 2008 coalition deal with the Maori Party, National agreed to repeal the Act and replace it with a new law that lowered the bar. National’s Marine and Coastal Area Act, which repealed Crown ownership of the foreshore and seabed and opened up the coast for Maori control, contained a 6-year deadline for lodging claims – April 3rd 2017. During those six years only forty or so claims were registered, including some that had been carried over from Labour’s 2004 law. But just before the deadline, an astounding 580 new claims were lodged! The Marine and Coastal Area Act provides two separate pathways for resolving claims – direct Crown Engagement and through the High Court. Of those new claims, 380 were registered for direct “negotiation” with the Minister for Treaty Negotiations, and 200 were registered with the High Court. A number of tribal groups are known to have ‘hedged their bets’ by applying through both pathways, but the details have not been released. The cost of National’s new gravy train is expected to reach hundreds of millions of dollars and tie up the Courts for decades. An $8.45 million appropriation in May’s Budget, from the $50 million Vote Treaty Negotiations, was specifically earmarked for financial assistance to claimant groups. Claimants who have lodged claims through the direct Crown engagement pathway can apply for taxpayer assistance ranging from $162,000 for simple claims to $412,000 for complex claims, while High Court applicants can apply for assistance ranging from $156,750 to $316,750. According to the Ministry of Justice, as at the 18th of July, a total of 18 of the 200 claims lodged with the High Court had been approved for the upper funding limits, with a further 57 waiting for approval. There will no doubt be many more in the pipeline. No details are available regarding the Crown Engagement pathway. While generous taxpayer funding is available for claimants, the deck has been stacked against those wanting to defend public ownership of the coast. Not only is no assistance available for anyone wishing to contest these opportunistic claims, but concerned parties must file a ‘Notice of Appearance’ and pay a $110 fee for each High Court claim they plan to oppose. That means any group wanting to oppose all of the claims – in the public interest – will incur over $20,000 in High Court registration fees alone. This, on top of the significant legal costs and other expenses that will be incurred, is a major deterrent. In spite of the generosity of claimant funding, some Maori groups are complaining it is not enough. Late last year, a dozen tribal groups lodged applications for an urgent Waitangi Tribunal inquiry into the Marine and Coastal Area Act, asserting that the funding for claimants was inadequate, and that the Act breached the principles of the Treaty. Some called for compensation for the loss of their customary rights. While the Waitangi Tribunal’s Chief Judge Isaac decided against an urgent inquiry, a “priority” inquiry was granted to determine whether the Act is in breach of the Treaty, and whether claimant funding is adequate. Hearings are expected to commence in April next year, with the final report expected in early 2019. With Annette Sykes and other counsel for the claimants advising that they will call for a halt in the whole claims resolution process, while the Waitangi Tribunal’s investigation is being undertaken, the Inquiry has the potential to substantially delay settlement procedures. Since Waitangi Tribunal reports are not binding on the Crown, it will be interesting to see how Labour responds to this new inquiry. The last time the Tribunal issued a report on the foreshore and seabed it was 2004, and then Deputy Prime Minister Michael Cullen attacked them for producing an inaccurate report, that rejected the principle of parliamentary sovereignty. 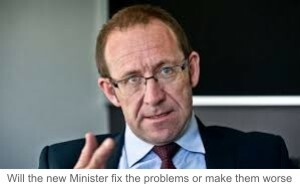 The new Minister for Treaty Negotiations, Andrew Little, has a key role to play in the whole coastal claims process. It can be said that he has inherited a ‘hospital pass’ from his predecessor Christopher Finlayson – not only in the form of almost 400 claims to the coast that need to be resolved through direct negotiation, but also in the Crown’s failure to represent the public interest in agreements determined by direct negotiation. So what are the chances of Maori gaining customary rights to the foreshore and seabed? At the heart of the matter is Section 58 of the Marine and Coastal Area Act, which states that to gain a Customary Marine Title over an area, a Maori group must prove that they “hold the specified area in accordance with tikanga” and “have exclusively used and occupied the area, without substantial interruption from 1840 to the present day”. Those who can prove exclusive use and occupation, have much to gain. Claimants will receive rights akin to ownership, including the right to charge all commercial operators who use the area, to impose wahi tapu to restrict public access, to veto all resource consents and conservation activities in the area, and they gain possession of all non-nationalised minerals – including all royalties from existing mining operations, back-dated to when their application was first lodged. “When New Zealand became a British Colony in 1840, it adopted British common law, including Crown ownership of the foreshore and seabed. Hence, from 1840 the public has generally had a right to access and use our foreshore and seabed. In many areas such as the Bay of Plenty, the East Coast, Mahia Peninsula and the Hawke’s Bay, the foreshore became the de facto road, as it was much easier to travel on than through the rugged inland forests. For example, livestock were driven along the foreshore between Hawke’s Bay and Gisborne because it was by far the easiest way to move sheep and cattle. “Urban New Zealanders have flocked to our beaches whenever opportunity was provided. In the early 20th century, baches appeared all over the coast where fishing, boating, surfing, yachting, diving, swimming, or other relaxation activities were popular. Because New Zealand’s coast is so attractive, having a bach at the beach became the norm. City dwellers greatly outnumber locals during the holidays in many coastal areas including Northland, Coromandel, the Bay of Plenty, East Coast, and the Hawke’s Bay. However, under the only direct Agreement negotiated by Minister Finlayson – without Court or public scrutiny – the East Coast tribe Ngati Pahauwera has been offered not only a Customary Marine Title over a 15km strip of the Hawke’s Bay coastline that was used as a public road, but also a Protected Customary Right to collect hangi stones – in an area that extends 22 kilometres offshore to the outer edge of the Territorial Sea! From the information released by the Minister, the tribal evidence relied on was so flimsy as to make a mockery of the whole claims process. For instance to satisfy that the area has been held in accordance with ‘tikanga’, the Minister relied on affidavits such as, “I have always known that the Ngati Pahauwera rohe moana is ours, and that we have always taken what we need when we need it.” And, “The sea, the seabed and foreshore and all the resources within them are part of who we are”. When it comes to their claim that they “have exclusively used and occupied the area, without substantial interruption from 1840 to the present day”, history shows that in the early years, most of the land adjoining the claimed area was alienated to settlers, the foreshore was used as a public road, the area was reliant on coastal shipping, there was shipbuilding, shore-based whaling, and gravel extraction. There was also public fishing, surfing, swimming, and recreational boating. In 1867, a Port was gazetted in the area, and there were even plans to establish a Harbour Board. If the low standards of proof for the existence of customary rights applied by Chris Finlayson in the Ngati Pahauwera case are adopted by Andrew Little, the entire New Zealand coastline could end up under Maori control. The new Minister should prioritise an immediate review of Chris Finlayson’s Ngati Pahauwera agreement – which has not, as yet, been signed. If left, that agreement would set a dangerous precedent that could result in most of the coastline falling into tribal hands. When Labour and New Zealand First were last in office, Helen Clark and Winston Peters made a principled decision to ensure the foreshore and seabed remained in public hands. New Zealand needs those parties to step up again – now. It’s an important test – whether the new Labour-led Government is prepared to stand up for all New Zealanders, or whether it will take the easy way out and appease its Maori caucus. If so, title of our foreshore and seabed will pass into tribal control, and New Zealanders will be forever held hostage to their demands. Should claimants under the Marine and Coastal Area Act be granted customary rights to areas that are regularly used by the public? And tears were shed when National lost the treasury benches !! Only hope of curing the racist disease that National established, will be to get the message through to NZ First that this is their chance to emerge as a shining light. Start by inundating NZ First MPs [not just Winston] with emails, reminding them why they received enough support to make it into Parliament.. A.G.R.